The AV3012 hatch lifters are electromechanical products, especially designed for marine use on pleasure boats. They allow full or partial opening and closing of heavy engine hatches, peak tanks, hatch beams etc. By activating a switch, it is possible to lift the hatch to any desired position from closed to full open; an internal self-locking mechanism will maintain the position preventing any accidental hatch closing. In case of a power failure an emergency device allows for manual opening. According to the load required, the AV hatch lifters can be mounted individually, or in twin cylinder installation for heavier loads. It is also possible to install more then two AV actuators in multiple applications. The AV hatch lifters do not require any maintenance, are easy to install, and are made of materials resistant to corrosion. The AV Series hatch lifters can be opened freely in the event of a power failure, and can therefore open while underway. The AV Series hatch lifters are not intended for use on high performance boats or in applications where the hatch may open unintentionally. For these applications we recommend the AV-L series hatch lifters, which stay locked when the actuator is in the closed position. where the hatch could blow open, we recommend the AVL series which pushes as well as pulls with 265 Lbs. All mounting hardware is included. According to the load required, the AV hatch lifter can be mounted individually, or in twin cylinder installation for heavier loads. It is also possible to install more then two AV actuators in multiple applications. Maximum load for single installations: 1200N (120 kg - 265 lbs)  Maximum load for dual installations: 2400N (240 kg - 529 lbs) Maximum load is recommended not to be exceeded. Supplied with all mounting hardware. Stainless steel telescopic ram for manual operation in case of emergency. Locking version (AV-L) recommended for high performance applications. Circuit breaker to stop accidental overloading of the system and electronic stop at closed or full open position. IP 65 protection rated Speed: 25mm/sec no load applied, 17 mm/sec maximum load Current absorption in single installations: 10A at 12V, 5A at 24V  Current absorption in dual installations: 20A at 12V, 10A at 24V AV 12VDC models are Ignition Protected. UL1500 - ISO8846 approved. 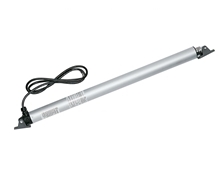 This hatch lifter is durable and easy to replace. Thank you. Fast shipping and arrived as described.